Whether it’s the sight of a flower blooming, or if you’re David Attenborough, the birth of baby elephants and tigers, the first glimpse of Spring does wonders to raise our spirits. A walk in the countryside or stroll in the park will reveal new growth in the flower beds and on the trees and the whole world seems to come alive once again. For viticulturalists and winemakers, Spring brings the same exciting feeling of expectation in the vineyards, as it’s the time of the first crucial milestone in the year-round process of producing wine – budbreak. 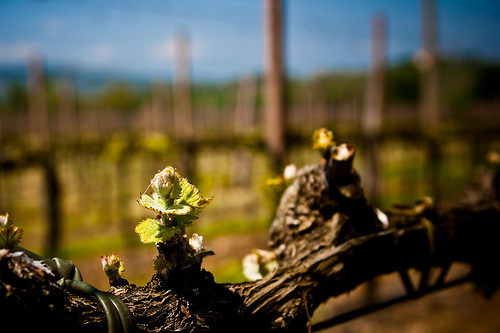 Budbreak signifies the start of a new vintage and all the hopes and hard worth that come with it! However, as important a time as it is, the term ‘budbreak’ isn’t one we usually hear a lot about – so what is it and why is it so important? During the winter, the bare vines have been pruned to preserve the shape of the vine and to regulate the following season’s production by restraining the number of buds that will bear fruit. When the cold of winter warms into spring, the vines seem to share our excitement and shed tears of joy at the rising temperatures, meaning budbreak is just around the corner. In fact the vines aren’t crying, rather ‘bleeding’…water. Water (and other nutrients) is forced up from the root system by the warm soils and drips out from the pruning cuts – sometimes up to 5 liters per vine! Soon after the bleeding stops, the vineyard begins to change color, turning green with the growth of the first young leaves – this is budbreak. This exciting event usually takes place in March (or September in the Southern Hemisphere) when the average temperature reaches 10?C / 50?F but often happens earlier in very warm climates and later in colder ones. It is indeed a celebratory occasion as the winemakers welcome their new babies to the vineyards that they will tend and care for over the next 6-8 months until harvest. At this stage the hopes are high that Mother Nature will be kind and the weather throughout the summer and fall will allow the grapes to ripen well, making for a vintage that exceeds expectation. 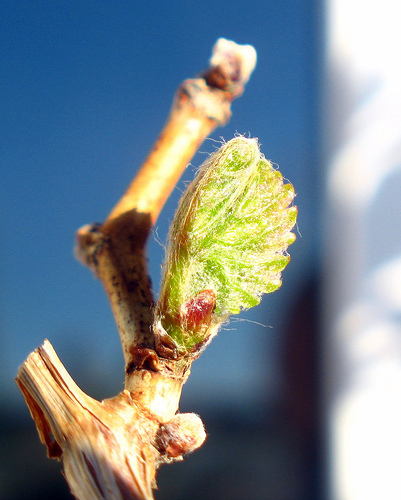 However, budbreak is a vulnerable, and often perilous, time in the vineyards and just as all parents of new babies worry about every aspect of keeping their child safe, so too the winemakers strive to protect their vines from the diseases and pests that can attack and harm the vines at this early stage. The biggest concern is the cold spring frost which can half the growth of the new buds or destroy them all together. Maria Elena Jiménez and her sister-in-law, Marta Casas, are the winemakers at Parés Baltà in Penedès and Priorat in Spain. She remembers in 2001 everything was going well until a late frost hit. The shoots and leaves were dying and she and Marta had no choice but to prune the vines again and hope new shoots would form. They did, but the damage was done. The growth of the vine leaves (or canopy) was 50% less than it should have been, the grapes didn’t have as much time to ripen and mature as they needed, so the structure and composition were severely lacking; so much so they couldn’t use them for their premium wines and ended up selling most of the juice in bulk. Fortunately only a small section of their vineyard area was affected. To protect from something this devastating, winemakers in many regions will use heaters and wind turbines to keep the temperature higher and prevent frost from occurring at all. Another concern, and one that comes without any notice or preventive measures is the unexpected storm. Hail is a major enemy of the vineyard at any stage, but no more so than at the precarious time of budbreak. In 1998 the Douro region of Portugal saw such a tempest. Oscar Quevedo works for his family winery ‘Quevedo’ with his winemaker sister, Claudia. He told me about one of his earliest recollections of a disastrous hailstorm. One morning, there was a loud banging on his father’s front door, when Oscar opened it he found his neighbor, a winemaker, who had just been to the vineyards and seen the destruction, ‘He was crying like a child’, said Oscar. The man’s entire production had been wiped out by the damage from the hail. His vineyards looked as if they had been pruned a second time – and what was worse, the buds were affected, so the following year’s vintage was also harmed. “That year, budbreak broke the vintage”, Oscar said. Making wine can be (so I’ve heard) one of the utmost pleasures in life, especially when you see wine lovers enjoying the fruits of your labor, but it can also be heartbreaking and nerve-racking. Budbreak is the great gift of spring and heralds the thrill and expectation of a whole new vintage, but if you meet a winemaker in the spring time, check out their fingertips as it can also be a nail-biting journey with Mother Nature as co-pilot!